PAAL Apartments near Sagrada Familia. This apartment is located on the second floor of a building with lift and can accommodate up to 4 guests. The bright coloured decoration conveys a cosy and welcoming atmosphere. In the living room you will find a comfortable double sofa bed, a table with four chairs and an armchair, ideal for your moments of relax after an exciting day in the city. 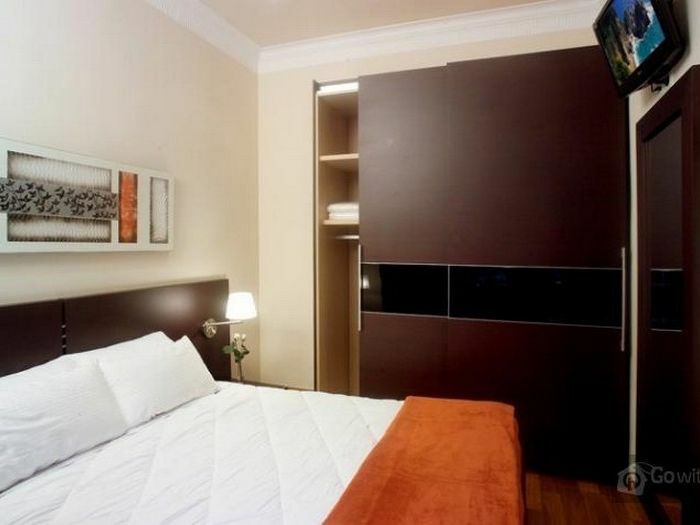 The bedroom includes a double bed, a big and functional closet with sliding door and a flat screen-TV. The bathroom comes with a shower and the kitchen is equipped with all the necessary utensils, so you can easily prepare your favourite dishes. The apartment also offers amenities such as parquet floor, a laptop with Wifi internet access, air conditioning and heating. Nearby the property you will find various Bus and Metro stops (Monumental- L2 / Sagrada Familia L5), from which you can easily access any point you wish to visit in the city. Check-in is between 16:00 and 22:00. Late check-in after 22:00 will incur an additional charge of 30€. Furthermore, check-in on the 24th, 25th, 26th, and 31st. December, and the 1st January will incur an additional charge of 30€ (these charges are cumulative). Security deposit is only accepted by credit card. Should you wish to pay in cash this will result in a 20€ surcharge. Check-out: The latest possible time for check-out is 11h. Should you not have left the apartment before 11h you will be asked to leave immediately and you will be charged a surcharge of 50€. An extra cleaning service during your stay including a change of sheets and towels is available. Please consult with the owner for information about prices and times once you have made your reservation.